When Barnes & Noble announced plans to spinoff the Nook division in January of this year, it seemed likely that B&N wanted to find someone else to fund the capital intensive development costs for the Nook hardware. Today B&N got another step closer to their goal. Pearson has just announced that they're buying a 5% stake in Nook Media. It's going to cost them $89.5 million in cash and puts the value of B&N's subsidiary at approximately $1.8 billion. Following the closing of the transaction, B&N will own about 78.2% of Nook Media and Microsoft will own approximately 16.8%. 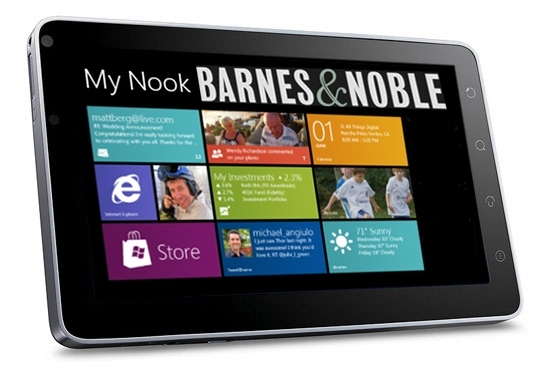 MS was the first investor in Nook Media, and they brought $300 million to the company when it was first announced in April as Newco. On a sidenote, Pearson also has the option of buying a second stake in Nook Media at the same price as they're paying today. It's not clear yet what MS is getting out of the deal, but why did Pearson get involved? According to the press release, they're in it for the same reason B&N College was pulled into Nook Media: the academic market. With this investment, we have entered into a commercial agreement with Nook Media that will allow our two companies to work closely together in order to create a more seamless and effective experience for students. It is another example of our strategy of making our content and services broadly available to students and faculty through a wide range of distribution partners. So it's a horizontal integration then. It's not quite a vertical integration; Nook Media is not a distributor or a retailer. They develop the Nook apps and hardware and are probably working on something new for digital textbooks (why else would Pearson be interested). And now that one publisher has invested in Nook Media, how long do you think it will be before the rest of the major US publishers buy a stake? I'm thinking 6 months, myself. Any number of people in digital publishing have argued that publishers should buy a retail channel so they can compete better against Amazon; an interest in Nook Media could be exactly what they wanted. It would give publishers a direct relationship with one of Amazon's competitors. And when it is trounced by Amazon, the pain will be all that much sharper. Its also easier to code textbooks to work with the Nook than it is with the Kindle (excluding the new Kindle 8 standard which I haven’t played in depth with yet).